I wasn’t going to do that anymore but after 270 pages of boredom, I had to put the book aside. 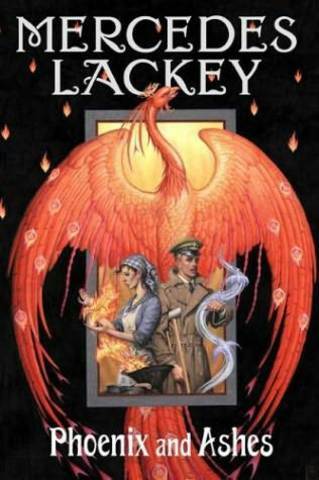 I’ve got a pile of books on a small shelf, just opposite my bed, and while reading Mercedes Lackey’s novel Phoenix & Ashes I kept on looking at the titles of books I just bought (The Flamethrowers, The Interestings, Nobody is Ever Missing . . .) that I wasn’t reading because of this. I skipped to the end, read the last two chapters and that was that. The idea sounded so original. A retelling of Cinderella set right after WWI. Unfortunately the result is neither a proper historical novel, nor did it feel like real fantasy. It was more like an author filling pages using painting by numbers for books. You can’t just take a fairy tale, and use the story as plotline. Fairy tale retellings need to tell us something new about a fairy tale. They shouldn’t just be abused because the author has no story of her own to tell. A novel like this needs great characters but I found them all very one-dimensional and uninteresting. The period detail was well done, but it wasn’t anything new. You could watch Downton Abbey and get more out of it. Or read one of the many excellent historical novels set at that time. No need to trudge through 480 pages of something like this. I was also annoyed because of the very poor editing. Or shoddy proofreading. So many mistakes in a book are not acceptable. Luckily I have only one of Mercedes Lackey’s novella’s on my shelves. I’m not going to pick that up any day soon. I thought this book was a waste of talent, because she isn’t a bad writer as such, but sadly this is a lifeless, uninspired book. My sincere apologies to all those who picked this up because of the readalong. I know Emma had the same reaction and gave up after some 100 pages. But I’m equally sorry if someone loved it and has to read such harsh words now. Phoenix & Ashes is the tenth book in the Literature and War Readalong 2014. The next book is the WWI novel Flight Without End – Die Flucht ohne Ende by Joseph Roth. Discussion starts on Friday 28 November, 2014. Further information on the Literature and War Readalong 2014, including the book blurbs can be found here. Oh no it’s so frustrating when a book disapoints. No point in carrrying on sometimes life is too short. It is frustrating. Because I chose the book I feel particularly bad about not finishing but it was so boring. You did the right thing – I agree with Ali that life is too short and there are so many *good* books to read! That’s what I was thinking. I really didn’t enjoy it. It felt like a chore. Sorry to hear this one didn’t work out. But they can’t all be good, and sometimes a bad book makes us appreciate a good book even more. Maybe that’s why I enjoy all the books I’m reading right now. This was really not a good book. This really is disappointing as I think that the concept behind this one was really good. I too have trouble with books that seem unoriginal and unimaginative. It was so lame. Looking back, reading 270 pages was too much. To be honest, even the concept doesn’t sound that interesting. Also, 480 pages, really? Contemporary fantasy tends to be bloated, and I don’t think it does the genre any favours at all. I so agree with you. This one is really bloated. I don’t know why I even bothered reading this much. Well, as you said, I abandoned it too. Totally disappointing. I’m particularly sorry because I know you don’t read a lot of fanatsy and then a book like this! Max is right – it’s not doing the genre any favours. I don’t know why, but I have a real aversion to classic tales being reworked. Sorry you had to invest in what sounds like a real disappointment, Caroline. I’m less brave than you–if it’s not good by 100 pages in, I’m done. I’m so glad you liked Skellig. I think I would have stopped after 50 pages if it hadn’t been my readalog book. Yeah well . . .
I’m one of the finishers but I have sworn not to do that anymore. It’s a bit obsessive. Sometimes it’s just the wrong moment. I should have been suspicous when I saw that she turned the idea into a series, going through all the major fairy tales. I love fairy tale retellings and while Angela Carter is one of the most amazing, there still are many other fantastic examples. Don’t tell me . . .
Well, now I don’t feel so bad about not finishing it. I was trying to decide what excuse I would make because I think this is only the second readalong that I did not finish and that is out of at least thirty books. I had a different reason for abandoning it after about 80 pages – I found it to be silly. The talk of Elementals and such was laughable to me. I think I would enjoy a sci-fi / fantasy type war novel if it had futuristic battles in it, but not a drama like this book. I did enjoy “Ender’s Game” and “Starship Troopers”, but this book was not like those. Your attempt to go outside the box was commendable, but this was too far outside the box. It did feel somehwat silly to me as well although I’ve seen other authors use elementals or similar forces but they did it in a different way. This was just bad – in every possible way. I’m glad you didn’t firce yourself to finish. I would have opetd for a Sci-Fi book if the focus hadn’t been WWI. I thought it sounded promising. There were even people who compared to to one of Sarah Water’s books. Well – I don’t think so. I never used to think like that but recently I also find it’s not worth going on reading something that doesn’t appeal. Too bad about this one. When I first saw it at the beginning of the year it looked like a fun read–but I don’t like the idea of it being so uninspired. And it is always worse when you look at the books you would really rather be reading! Hopefully you were able to pick up one of those other books in the end? I hope so too. It’s certainly not worth spending precious reading time on a book like this. I’m glad you didn’t even start it.